In France, climate change deniers are few. As a matter of fact, I can think about only one name : Claude Allègre, a former scientist who now is a politician. 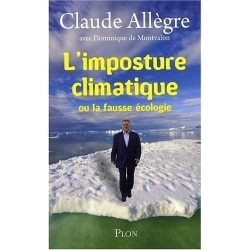 His latest book – L’imposture climatique – is a model for climate deniers. I propose in today’s post a selection of quotes from Real Climate’s post with the most interesting and straightforward facts. One of the more egregious examples of blatant making stuff up was covered by Science last week (following on from a post by Huet who revealed that Allègre had hand-drawn a continuation of tree-ring data from Hakan Grudd to show cooling over the 21st Century – something of course that no trees could possibly show (at least yet!). Even before Allegre “improved” the data by drawing in an extension more to his liking, the implication that Grudd’s work in any way challenges the prevailing view of unusual large scale warming in recent years was highly misleading. But much of the joy of reading this book is in details – things that it would be trivial to get right without having much impact on the general thesis being put forward, but instead reveal without doubt that the author does not have a single clue about the subject. Overall, the book is as full with conspiracy theories and insults against climate scientists as any blog you might find on the wilder shores of the internet. However I have never seen something as bad as this from someone who is a leading member of a National Academy of Science. Lindzen (a member of US National Academy) writes articles that are a model of scientific decorum in comparison! In describing the history of the different IPCC reports Allègre introduces the different participants as “religious fanatics”, “Marxists” in search for new arguments to destroy the civil society, “greedy” and “mediocre scientists” (all literal expressions from the manuscript). The list of accusations against Jim Hansen for example is nearly unbelievable. Among other things Allègre makes the astonishing claim that during the last 15 years Hansen has done no scientific work and that he has forced his collaborators to put his name on the publications. Over that period, Hansen has listed 68 publications with 37 as first author – thus the scale of his perfidy would need to have been immense! I asked Gavin whether GISS is really the slave camp implied, and he just laughed. Hansen presumably can’t be bothered to deal with this kind of accusation, but Allègre’s claim is almost certainly libelous. The truly astonishing thing though is how hermetically sealed and impervious to fact Allègre’s whole argument is. No-one is honest, every result is fraudulent (excepting of course, Allègre’s ‘true curves’), no-one is without an agenda (except Allègre of course, and possibly Michael Crichton) and any scientist espousing the mainstream view or journalist questioning him is a Stalinist. Any contradiction of his arguments is simply proof that you are part of the conspiracy. It is this error that is the equivalent of ‘dividing by zero’ – once you have convinced yourself that only your own opinion matters, you can prove absolutely anything to your own satisfaction – but, unfortunately, to no-one else’s. Many thanks to my friend Xavier Hahn for sending me this article. I wanted to write a post on Claude Allègre and he gave me the occasion to do so.